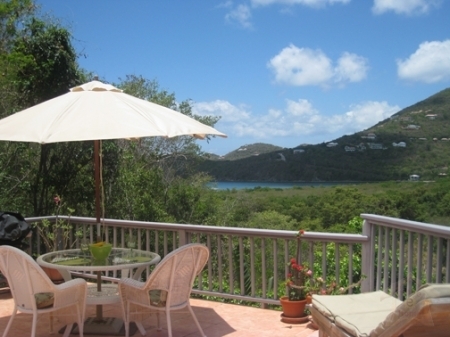 Welcome to Tranquility, a romantic little villa on beautiful St. John, US Virgin Islands, where the living is easy, the views are lovely and nature abounds. 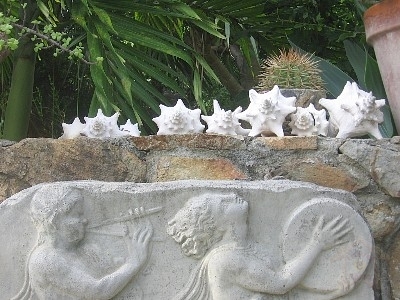 It is a breezy, easy kind of place to unwind and relax, an oasis of natural beauty year round. Care and sensitivity to the environment have made Tranquility a special retreat for the eye and soul. It is a private, spacious and unique little villa with high ceilings and 1,000 + sq. ft of living space which includes wrap around decks for sunning, sunset viewing over the water in Fish Bay and stargazing. Tranquility is fully equipped with all the amenities, comforts and artistic touches while being moderately priced for a couple or small family. Equipped with air conditioning in the large master suite for the benefit of summer guests it is still possible to enjoy the natural cooling provided by the canopy of native shade trees and the glorious trade winds wafting through the airy and spacious little home. 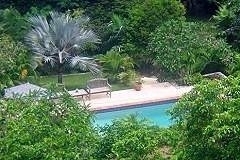 Tranquility is eco friendly, designed to take full advantage of the cooling trade winds, solar panels heat the water and a short walk down a garden path brings you to the large (15 x 30’) pool, which you will have all to yourself in a veritable Garden of Eden setting. Nestled in the trees on a secluded knoll above Fish Bay on the one side and the luxuriously secluded Reef Bay on the other, Tranquility is located in Fish Bay, a quiet residential area on the south shore with a mix of residences and vacation villas. The National Park’s virgin forests and beaches are close by. 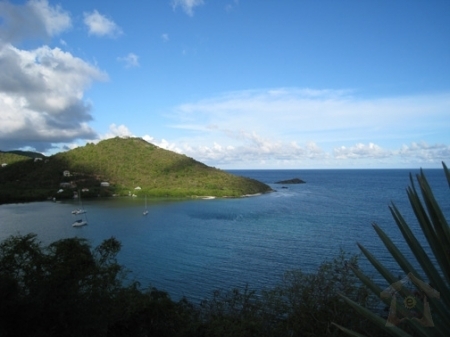 A short walk takes you down a path to the breathtaking Reef Bay, a luxurious, long beach and secluded and private. Off the beaten path and with no roads directly to the beach, it is possible to have the famous National Park beach all to your self! 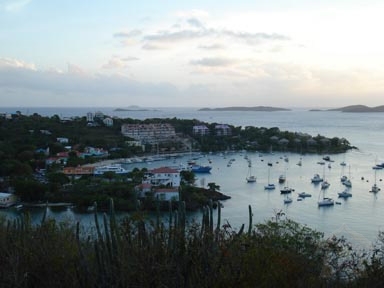 Fish Bay is only 10 minutes from Cruz Bay, convenient for trips to St. John’s North Shore beaches or dinner and shopping in town. More than half of Tranquility’s guests have been honeymoon couples who have thoroughly enjoyed the romantic and tropical appeal of Tranquility, which can also accommodate a small family. 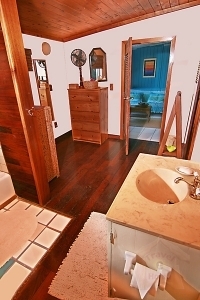 The den is a completely separate room with louvred doors and access to the large bathroom through it’s own door. The bath can also be accessed from the kitchen hallway so that it is not necessary to go through the den if guests are in it. A futon opens up to a full size double bed, with an overhead ceiling fan to cool the room, which opens onto the front verandah with a view of the bay. Guests love coming home to the peace and serenity of Tranquility which truly lives up to its' name.